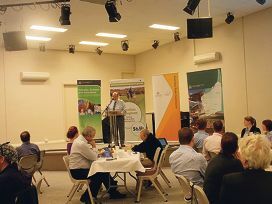 Vice president of the Northam Chamber of Commerce John Proud at the briefing. Ms MacTiernan said schools would feel the affect of the ‘Vincent baby boom’ by 2015 and existing infrastructure would not be able to cater for the number of young children living in the area. ‘We think the need for primary schools is going to grow based on the 24 per cent growth in 0-7-year-olds,’ Ms MacTiernan said. Ms MacTiernan said reopening Leederville Primary School, which currently operates as the School of Distance and Isolated Education, could cater for families living to the west of the city. She said the School of Instrumental Music, which used to be Maylands Primary School, should also be reopened as a standard school. ‘The State Government hasn’t planned for this properly and it is going to be a huge issue come 2015,’ she said. Education Minister Peter Collier said existing schools were able to meet current demand, but said the Education Department was looking at options to cater for the growing inner-city population. Perth MLA Eleni Evangel said improving school infrastructure in the area was her priority, but it was premature to make decisions about expanding or increasing schools. Education Department statewide planning and deliver director Lindsay Hale said options to cater for more students into the future could include additional classrooms and installing transportable classrooms at existing sites.